The remains of the day were a sad blur. I put on a “happy face” for the sake of the other students… but inside… my heart was shards of hurt and disappointment stabbing me… slashing me… the pain was almost unbearable! Thankfully, we spent the late afternoon before dinner on our own… I had planned to visit the Jewish shopping district and buy authentic prayer shaws for my husband, son, and son-in-law. Instead, I went back to the guest house… and my room. Turning the air conditioner to 55 degrees I collapsed under a scratchy wool military blanket and slept. A little sleep always changes my attitude… and true to form, I woke up feeling less overcome. The acute heartache was replaced by a dull ache in the middle of my chest and head. The sadness still hung over me like the rough wool blanket that covered me from my nap. Dinner was served at 8:00 pm each evening in the downstairs level of the guest house. We ate Kosher, as we were guests of Messianic Jews. Delicious food …. healthy food. Much of the same fare was served for breakfast, lunch, and dinner! Tomatoes, tzatziki, baba ganoush, olives, pita, fabulous olive oil, pickled onions, hard boiled eggs, and salads. All of this and more was served alongside of our main dishes. And each evening we had some sort of performance or program to entertain us in the outside courtyard. The outside courtyard was a pristine large paved plaza surrounded by sand colored buildings, like much of Jerusalem. In the right hand corner of the courtyard sat Christ’s Church. A beautiful architectural structure with arches and alcoves and stained glass windows. A stunning blend of respect for the old city and a nod to its Anglican roots! Big palm trees made an overhead canopy in the courtyard that covered us with shade by day and made a softly swaying roof by night! Huge clay pots of colorful flowers dotted the courtyard. Taking our coffee and dessert in the courtyard followed by entertainment had been our custom while we were there. The last thing I wanted to be was entertained that evening. I did not want to participate… I did not want to clap to the music… It was too hard for me to learn a new song in Hebrew… I could not even think straight in English! And I was too tired to make the effort because now the dull ache of a pain had now settled into a sulky heavy hardness. 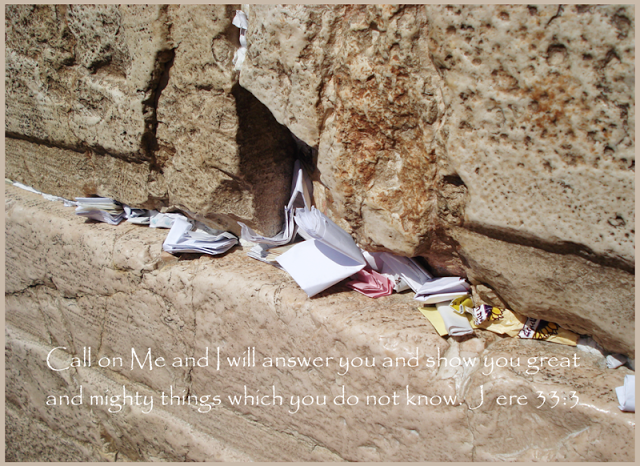 Hard like the stones of the Western Wall… and about as thick. We settled in the courtyard… I had a cup of coffee and no dessert… and I took a seat away from the circle of chairs that had been purposely placed there for the entertainment. I was in self quarantine, not wanting my mood to spread to the excited and happy group… and truthfully, a group I did not want any part of! Eight mid-Eastern young men, probably as young as twenty and no older than mid-thirties, took their places on the chairs at the front of the circle. They looked very different than us… very ethnic. Dark and rugged and many were very handsome. They had guitars… that looked as beat up as I felt! They introduced themselves and began telling us their story…At first, I was listening with just my ears… but soon their words began chipping away at the wall of hardness around me. These men, all Israelis, Arab and Jews now Christian believers spoke of their dedication to each other and their deep love for Christ. It seemed almost impossible that these two groups that barely associate except for dissension, would come together and talk let alone love each other. One thing I had to learn while in Israel was the deep divide and mistrust and dare I say hate the Arabs and the Jews have for each other. It is a divide that spans millennia! But the love that surrounded these men was so palpable that I breathed it in! The warmth of it filtered all through me! The hurt and disappointment that filled me most of the day began to slowly disappear as the men gave their incredible testimonies! Many were rejected by their families… they gave up their fortunes… they lost everything and were hunted by radical group wanting to kill them all because they came to a simple, yet saving truth. Jesus was their LORD! This is the one thing that could galvanize two groups in enmity! They told stories of kissing their wives and children each day and holding them so tight not knowing if they would return to them that evening! Their mission was to love all people both Arab and Israeli that came across their paths and proclaim the free gift of salvation through Jesus. And they did this in the most dangerous parts of the country. Parts that we could not venture into for fear of harm. By now most of our group both men and women were crying. Crying for these dear men, servants of the Gospel.Crying for the love of the brethren! I was crying too! It was more than emotional…it was spiritual! The men had just come back from Jericho that day. We had planned a trip to Jericho earlier that week, but it was too dangerous to travel there because it was full of hate and unrest. But these men went to Jericho that very day! They had rented a second story room with a window opened to the street. They left the front door unlocked and wide open, as well as the window! In that room they prayed for a long time and then picking up their guitars began singing songs of praise and thanksgiving to God! Their goal was that people walking by would come up to their room and so they could minister to them. These men put themselves in grave danger trusting God and bowing to His will! They were ministers of the gospel of Jesus Christ. And people came! They were so drawn to these holy men! As they told us this story they picked up their guitars and began singing to us as well. Some songs in Hebrew, some in Arabic and some in English. It was the most beautiful music I had ever heard! It was during the singing that something miraculous happened! It was what I had been waiting for! The glory of God and His great presence surrounded me. It comforted me and loved me and filled me up to overflowing. The Holy Spirit came over this Jerusalem plaza and filled all of us… like the tongues of fire that lit up the disciples and changed their lives forever. God had spoken a great biblical truth into my life! 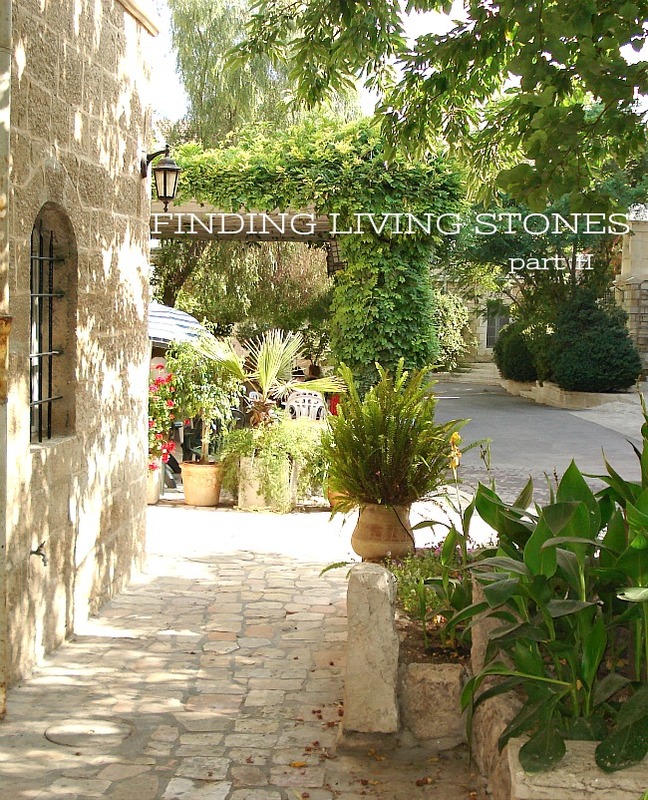 Stones have been an important part of witnessing to God’s presence and God’s work in the lives of His people. In ancient times people would stack up stones or place large stones on end so they stood up tall. These were called STANDING STONES. They were like our modern day monuments… celebrating and remembering an event or someone special. 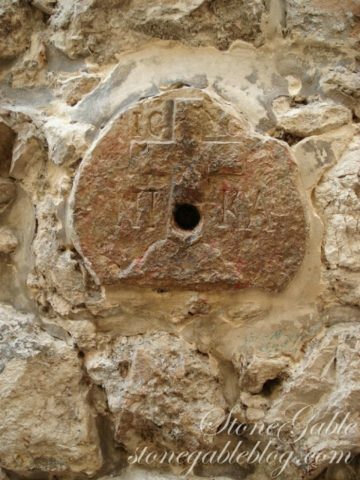 The stones were erected so that when ancient people would pass by they would ask, why is this stone here… and other’s could tell them of the wonderful works and person of God. Standing Stones. WE are standing stones! The very God of the universe in the form of the Holy Spirit lives in each of us who confess Christ as Lord (creator, owner). The presence of God I longed for lived vibrantly in these precious men and me! It lives eternally! That night God, the real and only God, the God who I worship showed Himself so big to me! He was not at a wall. He is shown through those who serve Him and Him alone! Look at me! I am a standing stone, a living stone, an undeserving monument to my Father! How about you? Are you a living stone in this world who need the good news of Christ like it needs the air we breathe? What a moving testimony! Yes, God is all around us, each and every day. We can find Him in the most odd but precious places. Linda, over my life I have found this to be soooooo true! Love this post, as well as last Sunday’s. Thank you for sharing, Yvonne. Thank you for being vulnerable in sharing your weaknesses, and being bold in showing our Lord’s great strength! Hugs! Beautiful!! 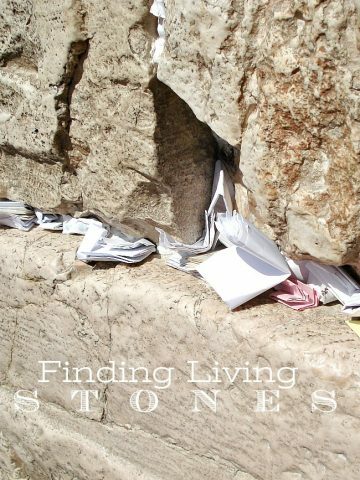 There is such truth in your writing.- To see the living God, in the living stones is confirming to one’s faith, and can give a deeper understanding of our Great God. Yvonne, thank you so much for sharing your story and your testimony. I struggle for words, my heart is so full. Sharing God’s love and and His grace and mercy shines through you. Jesus gave His life for us all. ?? All I can say is wow! And amen! Beautiful story! Thank you, Yvonne! What a beautiful testament! Thank you for sharing. As I finish reading this wonderful story, I find myself with the biggest smile on my face. Thank you, Yvonne, for sharing your love for our Lord. Thank you so much for sharing your experience! It reminded me of how God works through people and in amazing ways! What an amazing, inspiring story, Yvonne! Thank you for sharing. I look forward to your Sunday posts. Bless you. Thank you, Yvonne, for such a touching and moving story, one that all Christians know, but sometimes fail to realize how precious and real God’s love is for us. Thank you for sharing your experience. You write so beautifully and I am impacted by what you have described. Thank you for sharing this amazing God experience, I was very touched! Just saw the movie Let There Be Light and reading about these young men made me think that their story should be made into a movie. God’s love story for each of us out surpasses anything we can hope for! What a soul moving story! Thank you so much for sharing this with us! Thank you Yvonne for this moving inspiring story. I thank you for sharing your beautiful loving knowledge of the Lord with us each Sunday. My support phrase comes from Isaiah 43:2. My prayer today is that others who are feeling that crushing disappointment or a feeling of aloneness will preservere and know that they are not alone. What a wonderful gift! Thank you for sharing this testimony! As Paul Harvey used to say “the rest of the story” is the most beautiful part!!! In our lives also God shows up in the most unexpected places. All we have to do is wait on Him to surprise us with his presence. Sometimes He just wants us to wait with expectancy and trust that He is there. He will prove Himself faithful to His children. God definitely has a wonderful living stone in you Yvonne. You share God’s word with others and you live by your faith everday. Hope you have a blessed fall day???? Wow love your description of how you were feeling during your Israel trip. I can’t wait to go. Beautiful story and so well written. From the beginning I couldn’t wait for you to reach the God given conclusion you did; God is always with us, it’s just that sometimes in our zeal to create Perfect situations, we forget to look and more importantly, to listen. As I read this beautiful story, I felt God speaking to my heart. I was about ready to “throw in the towel” and quit teaching a rowdy group of boys at church. Don’t get me wrong, I understand their circumstances & I love and care for them deeply, but I’m not a “spring chicken” anymore and am exhausted and defeated every week after being with them. I wonder if they hear a word I say? But I have to believe God is listening and my prayers will not come back void. Thank you for a beautiful story of Gods faithfulness. This is a powerful lesson for all of us! God is ALWAYS with us!!! Thank you for the reminder. Powerful… Amazing when something like that happens. You feel closer to G-d..
Beautiful! Your story made me cry. God has blessed you with many beautiful gifts, but, your talent for writing, reaches out and touches many people. God bless you.